After another summer with two visits to Dover and the Global Open Water Conference taking place in Cork, some additions have been made to my little autograph book. And unfortunately I missed some autographs last weekend. The book continues to grow and seems to spawned at least two by other swimmers, the sincerest form of flattery! I keep forgetting to take photos of people signing it, apart from Steve Redmond whom I’ve photographed three times signing it. The book currently includes about 110 autographs that I can read, plus a few signatures that I can’t read (and a couple that signed without meeting the minimum requirement). If you know you are in the book and not on the list below, let me know. Also, yes, Sandycove is a nationality. 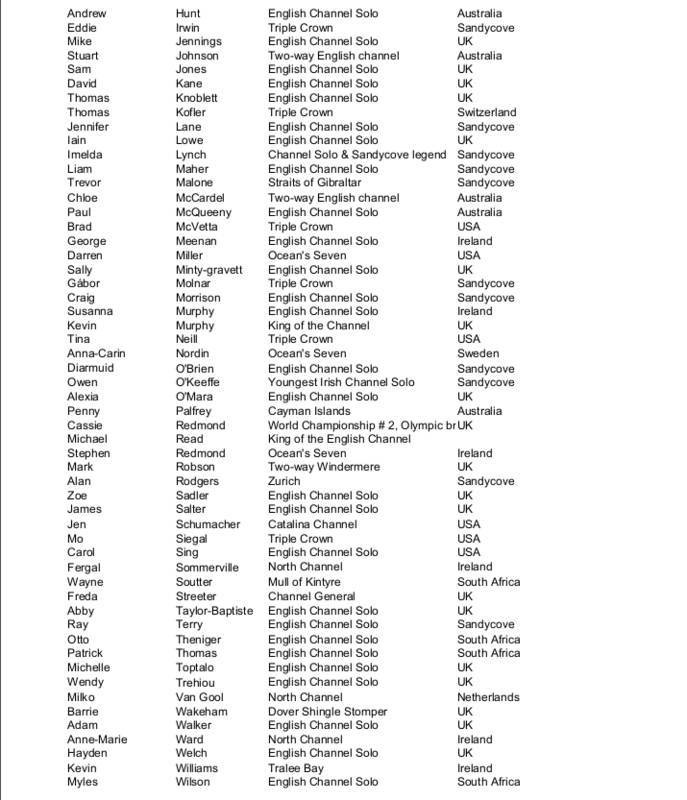 There are some non-marathon swimmers deliberately in there, such is their relevance in Channel swimming: Freda Streeter, Coach Eilis, Barrie Wakeham, Paul Foreman and of course my “parents” David and Evelyn Frantzeskhou with others to add in this category also. 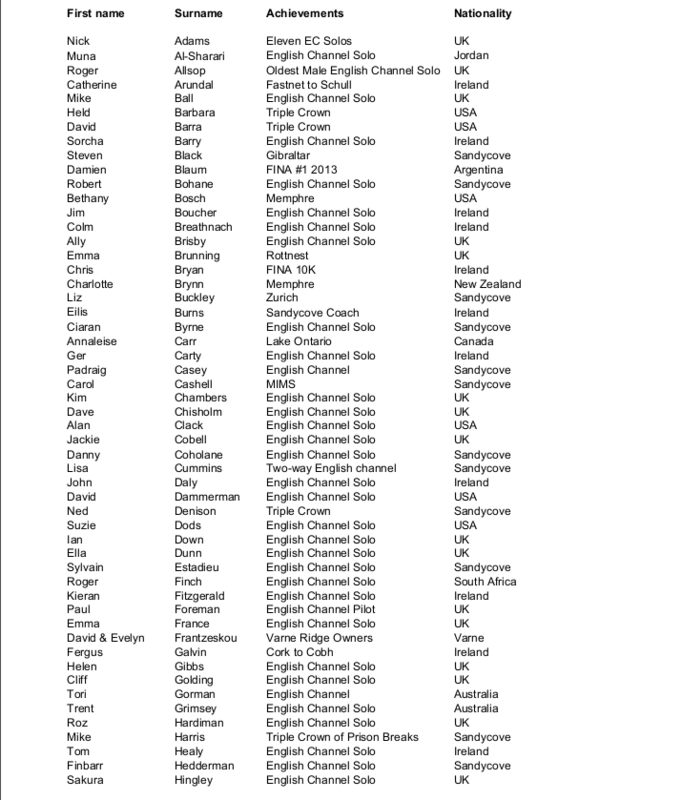 It continues to be great fun, and a great pleasure to see new Irish marathon swimmers also added to it each year. The index below mentions usually only one swim or achievement per person, but many have more swims identified either in the book or in the extended index file. Now, how do I get Ali Streeter, Abou Heif and Ted Erikson? ← The Diana Nyad Controversy, a personal reflection – Part 5 – Probity & Integrity. Great to read about your autograph book status. I see that it is lacking some latin flavor. Possible candidates for you to consider: Antonio Argüelles (Mexico), Nora Toledano (Mexico), Esther Nuñez (Spain), Miquel Suñer (Spain), Mariel Hawley (Mexico). Not only are they accomplished marathon swimmers, but they are generous and positive individuals with whom you would enjoy having a few beers. Yes, there are many gaps. South & Central America and the Middle & Far East. I do have Damien but never met Esther. I’ve spoken with Mariel Hawley online briefly, but I’d love to meet her and Tono and Nora, I know her signature in The White Horse quite well. I think of this as long-term project, though, I have years hopefully to meet those heroes! Great stuff to be in your book, next to real giants of open water swimming. May I kindly ask you to correct my name to Thomas W. (not Thomas) and the nation to Italy (not Switzerland). Sure thing Thomas, sorry for the mistake! Hi Have enjoyed reaing the various postings from Nyad to chocolate milk and everything in between.. Was on the copper coast a little this year so got to see again some of it in all its summer glory. All the bets, and keep up the good work…. You know Niek, I once knew that.